Rose Sandell, of Eagle Valley, nears the first climb of the Saturday's Nordic skate race at Maloit Park in Minturn. Sandell won the girls race. MINTURN — Of course, Huskies always prowl during the winter, but a Rose can bloom in the snow as well. Battle Mountain Nordic hosted most of the state for a skate race on Saturday, and the local squads excelled on home snow as the Huskies girls and their Devils counterparts tied for first with 167 points. Eagle Valley’s Rose Sandell won individual honors with a time of 18 minutes, 22 seconds. In the boys’ race, Middle Park edged Battle Mountain, 173-172, with the Devils (114) tied for eighth with Clear Creek and Summit County. Saturday’s race looked a lot like a running race one might see at Beaver Creek or at the Gypsum Creek Golf Course in the fall. Eagle Valley’s top three were Sandell, Michaela Mitchell (fourth, 19:44) and Karlina Feduschak (10th, 20:23). Battle Mountain featured Kaela Fahrney (third, 19:19), Sofia Piliero (fifth, 19:51) and Alex Raichart (sixth, 19:55). The gents were also blazing fast. Middle Park’s Tyler Scholl won in a flying 13:42. The Huskies’ Nick Apps was second in 14:21, followed by teammate Conner McCabe in third (14:47). Parker Rodeen was sixth (15:24) and Battle Mountain’s third racer. 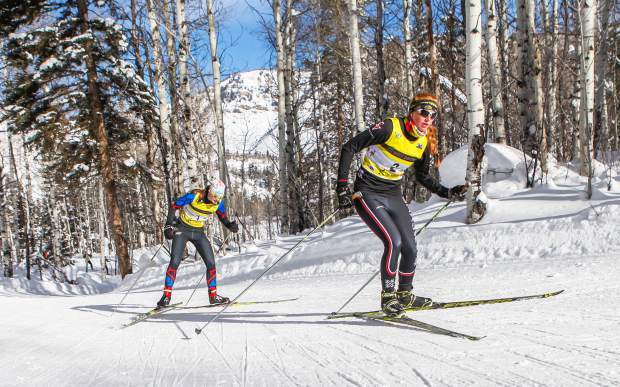 It was cold weekend for racing whether you were in Minturn, Ski Cooper or Middle Park. On the alpine side, the Vail Mountain School girls were second at a slalom up at Ski Cooper. Aspen swept the podium with the Gore Rangers’ Whitney Merriman sixth, Alyssa Hilb ninth and Renata Alvarez 23rd. Eagle Valley’s girls were seventh up in the thin air of Cooper, while Aiden Sokup led the Devils boys to sixth. The VMS boys had a tough day with Michael Resnick winning the first run, but being a DNF in the second go-round. Peter Mitchell led the Gore Rangers in 11th. Over in Winter Park, Haley Frischholz led the Battle Mountain girls to a win. The defending Skimeister won the slalom, teammate Kiana Brausch in second and Julia Dramis 13th. Battle Mountain’s boys finished second behind Evergreen with Kedrick Kinsella in fifth. The alpine season continues with the last giant slaloms of the season on Thursday. Eagle Valley and VMS are at Ski Cooper, while the Huskies are at Keystone. VMS Nordic returns to action on Saturday when it hosts a pursuit race at Maloit Park with the Huskies and Devils in attendance.